If you are unfamiliar with the story of Jim and Elisabeth Elliot - you have a treat awaiting you! The duo, both missionaries in the 1950's, inspired generations through serving in Ecuador with their toddler, Valerie. They had a love story like few others: they put GOD first every step of the way. After a short marriage, Jim was killed by the Ecuador people they were serving, yet Elisabeth stayed in the area with their daughter. Elisabeth's passion for the Gospel opened the eyes of the same people who killed her husband, and many accepted Jesus. Elisabeth went on to publish over a dozen bestselling books, a few of which detailed the God-ordained love story between her and Jim, such as the famed Passion & Purity. 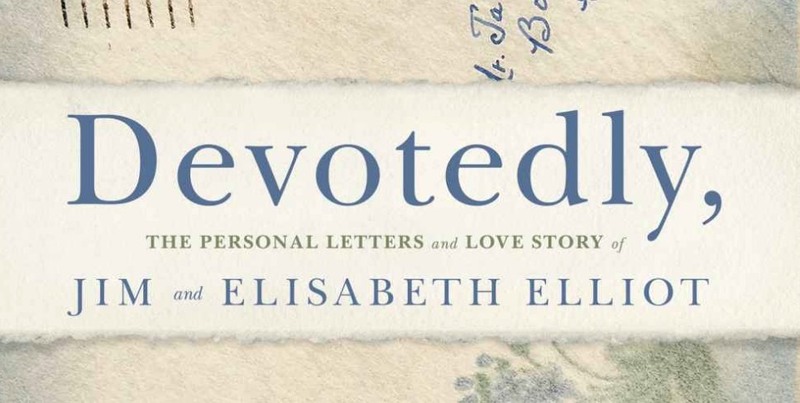 Valerie, the daughter of Jim and Elisabeth, has just released another book, Devotedly, presenting the love letters between the duo leading to their marriage. You'll be sucked in from the moment you begin reading this God-laced, old-fashioned, beautiful story of true love. Let's get to know Valerie Elliot! Advice for young women hoping to get married someday? Step one is to spend time in the Word of God! Learn to love Jesus; find your total security and hope in Him. A man of God will look for a woman secure in the Lord. Look to Christ to provide the husband, and He will bring him at the RIGHT time. And my advice: find a man who doesn’t take himself too seriously! My husband is fun-loving and light-hearted, allowing me to find joy and the ability to laugh when I otherwise take some things too seriously. Christ is the ultimate example, He was the most joyful man who ever lived! And also, once you’ve found the man you believe God has for you, do not overlook the importance and necessity of pre-marital counseling. This, ladies, is a huge help and stepping stone for new marriages. Advice for newly married women? My mom always told me the best advice: “Don’t try to change your husband.” It took me about ten years to fully grasp this, and it was through Christ alone that I did. It’s important to remember that you are married to a sinner, as you are a sinner. We are not perfect, and yet it’s easy to place an expectation of perfection on our spouse. (Very) high expectations are always dashed unless they’re given to the Lord! We need to stop complaining how our husbands “ought to do this or that” and instead learn to accept and love them. It’s not our job to conform our husbands! Make sure every day you are appreciating your husband in some way. Tell him he’s your hero! Look to the Lord to be a wife who honors her husband. Pray this daily: “Lord, help me to truly appreciate him.” Be thankful for the husband God gave to you! If there’s an issue bothering you about him, take it FIRST to the Lord through a prayer like this: “Help me to appreciate my husband more!” The Lord, in my marriage, gave me open eyes to see my husband’s gifts as a pastor and as a leader for our family. Favorite of your mother's books? They're all great, but my favorite is Shadow of the Almighty! It details the life story and testimony of my father, so I unsurprisingly hold this book very close to my heart. I also adore A Chance To Die, which explains the life of a role model of my mothers (and mine), Amy Carmichael. It portrays how Amy was willing to be the light and love of God, and it encourages us to follow suit. Third, a wonderful book by my mother which is no longer in print is called The Savage of My Kinsman. It is the story of our first year and a half living with the Indians. How have you strengthened your faith each day? I try to read the Bible every day; the more I read it, the more I feel blessed! I also have a prayer list for each day of the week. Spending time in prayer for those who mean a lot to me is, of course, incredibly vital in my life. As I grew as a woman and mother, I would get up earlier and earlier to make sure I had adequate time in prayer before my children got up. Sometimes I would wake up a full two hours before they did! I’ve always been a morning person, however; I suppose it’s because my mother put me to bed at 6:30pm when we lived with the Indians because that was when it was dark outside. Everyone, there, went to bed early and got up early. I love waking up with the sunset, and I believe that’s ingrained in me from childhood at this point! I love the preachers Alistair Begg, John Piper, and Chuck Swindoll! I love music with beautiful melodies; it seems many contemporary songs don’t have a beautiful melody as they used to! One song I love is “Jesus, My Only Hope” by Sovereign Grace Ministries. I also love the music of Lauren Daigle. My favorite, however, are hymns. I grew up listening to hymns, my mother would always play them! My favorite hymn artists are ‘The Gettys.’ And one of my favorite songs of recent in which I felt I almost was swept up to Heaven hearing is “10,000 Reasons” by Matt Redman. Do you feel God ordains love stories? I do! I remember when I attended Wheaton College, there was a professor who mentioned he felt the opposite. He felt God didn’t play a major part in ordaining our marriages. I spoke up and told him I disagreed! I felt then, and now, that God can and will bring the RIGHT person into our lives at the RIGHT time. I believe God is fully sovereign, especially when it comes to our marriages - which are such a huge component of our faith-walks, our ministries, and our lives. God will not bring anything ill-fitting into our lives; He knows what is best. It’s up to us to listen closely, which comes through Bible study, prayer, and a union with Christ.